KIEV, Ukraine -- Ukraine lacks the evidence to charge two men with plotting to kill Vladimir Putin despite Russian television airing a confession from them days ahead of Russia's elections, a report said Monday. A Russian Channel One undated television grab shows a man identified as Adam Osmayev, one of the suspected militants alleged to have conspired to kill Russian PM Vladimir Putin. Russia's Channel One television revealed the alleged plot to kill Putin in a report broadcast less than a week before presidential elections that the Russian strongman won in a landslide victory. His opponents had already cast suspicion on the plot — which the report said was hatched by Islamist militants in the Ukrainian port city of Odessa — as having the hallmarks of a stunt to boost Putin's ratings. “The investigation lacks direct evidence of the detained men preparing (to commit) an act of terror against Vladimir Putin,” the Kommersant Ukraine business daily quoted a source familiar with the investigation as saying. Kommersant said Ukrainian investigators had enough evidence to charge the two men with firearms and explosives violations — crimes that carried prison penalties to two to five years. The newspaper did not explain why the televised confessions — where both the suspects said they had plotted to kill Putin — were not considered sufficient evidence on their own. Ukraine's SBU security service refused to comment when contacted by AFP. 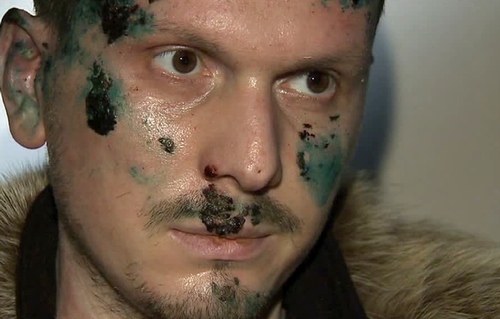 Interfax-Ukraine last week had quoted a Ukrainian security source as saying at least one of the two suspects was beaten into giving his testimony while in Ukrainian custody. “The police had to literally beat the initial testimony out of him,” the security source said. The state TV report showed testimony from two men with visible scars and bruises on their foreheads.